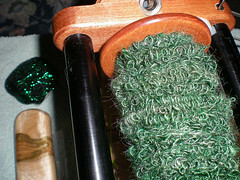 Ask The Bellwether: Why is my plying thread tangling? Why is my plying thread tangling? If you read this post ~ Do you want to play with thread? ~ then perhaps you've been playing with this plying technique. It's a great way to make effect yarn like boucle, super coils, and gimp. And it's a terrific way to stretch a single when you don't want it to be thicker, don't want to ply it on itself, but don't want to work with an active single in your knitting or crochet. But oh man can the thread be a headache! 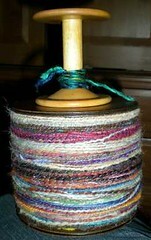 Put it on your vertical lazy kate, and it quickly comes off the spool and wraps around the metal post. If you aren't watching, snap goes the thread! Put it in a box or bowl, and it seems to develop Mexican jumping bean disease, hopping out and rolling across the room ~ delighting nobody but the dog. So, I was thrilled when I recently ran across a *really great* thread plying technique on a Patsy Zawitowski video. It's so easy, I have the tools permanently in my spinning kit now. Put the spool of thread in a sandwich baggie (ziplock or not, as you leave the end open), feeding the end of the thread out the open end of the baggie. 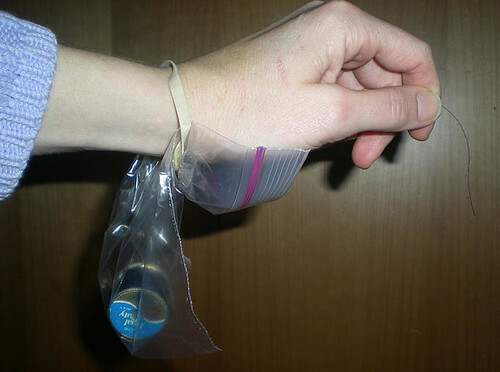 Take a large-ish rubber band and rubber band the baggie to the underside of your wrist, feeding the thread out of the end of the baggie. The rubber band shouldn't be super-tight, so the thread can come out. I've done this with spools and with little sewing machine bobbins -- the thread stays under control, nearby, and feeds out as you need it. Just remember to take the baggy off when you get up from your wheel. And because you can put the baggie on your fiber-feeding hand, this greatly simplifies the task of plying with thread for spindlers as well! Woot! Have you done some plying with thread? what techniques work for you? I'm always interested in learning more fun ways to spin! I have yet to try plying with thread, but whenever I get to give it a go, I'll certainly remember that clever solution! Thanks for sharing! Hmmm, I'm just about to watch one of Patsy's video's as I walk on my treadmill. I will be paying attention to the part of plying with thread! Thanks for a very good tip. I am so happy I found this! What a great idea!!!! Off to find a big rubber band.